If you were to ask people attending a weekend service or event, “When or how did a live scene change on stage in the dark?” Most people would not have a clue. Unnoticed and in charge of more things than anyone else in a live production, is one of the most valuable production individuals on the team, the Stage Manager. They are the Black Ops commander of the stage. They are so top secret; most individuals that attend a church service see them rarely. Very few know that a SM has super night vision capability, able to see in pitch blackness in order to move scenery to a destination. They are able to leap from behind a curtain in a split second, like a stealth bomber, dropping an arsenal of fresh batteries in a wireless microphone and disappear. They refer to pieces of equipment like they were people with feelings. Who are these unsung individuals that protect our domestic and foreign stage soils? We all genuinely love seeing all of the different pieces of a weekend service or event come together. But without the help and support of a skilled SM the chances of success is highly unlikely. Most Production and Programming teams have the opportunity to see close hand the hard work that these gifted, dedicated individuals do toward crafting a seamless service but yet go unnoticed. Their weekly actions, approach and “can do” attitude inspires us all. Amid the mayhem of live situations, they are still able to provide practical and organizational support toward the pastors, worship team and performing arts team. It’s a pretty intimidating job when you think about it. They coordinate communication between all parties. Help individuals to be ready to move on or off stage in a timely manner. Move scenery and props in a live situation. Supervise safety, lock, unlock doors and manage break times. Sweep, mop and manage a crew of volunteers. Gaff label everything with amusing labels and strike a whole truck load of things after service. I once heard that a stage manager died, went to St Peter’s gates to talk to Peter when a blackout occurred for about 15 seconds. When the lights came back on, the gates were struck, and Peter was gone. They do an incredible job toward detail, staying calm and focused. 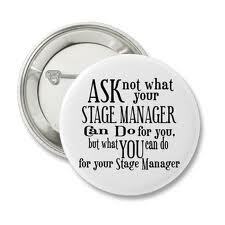 One thing I’ve learned over the years, you listen to the stage manager and you do what they say. They have very little sympathy toward any lame excuses. They were there way early in the morning before anyone was there and they will be late leaving, hours after everyone leaves. Beware! Any excuse or messing with an SM will cause them to devise a secret plan for your physical harm. Remember, they are superheroes with cunningness and brute strength, able to lift tall buildings and walks under them. Let’s show our respect, appreciation and attention to these unsung heroes. Take time today to tell them how much you appreciate them. 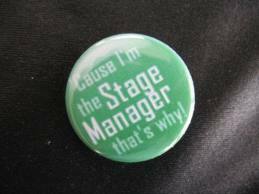 Things you won’t hear a stage manager say. I think Godly thoughts when someone screams in my wireless in-ear Comm. Can you construct the props beefy and heavier? I love scene changes, let’s add one more. You can use my gaff tape any time you want. I love wearing black clothing so much, that’s all I shop for. Spiking the stage, are you kidding me? That’s a waste of tape. Scenic is more important, go ahead and block stage entrances we’ll work around them. You have 1 minute before you go on stage, go ahead and take that potty break.